Designed as two large rectangles that seem to slide past one another, the long, horizontal residence that Wright created for 28-year-old Frederick Robie, boldly established a new form of domestic design: the Prairie style. National Register of Historic Places. National Historic Landmark. Open to the public with tours available. As the first uniquely American architectural style, it responded to the expansive American plains by emphasizing the horizontal over the vertical. A dramatic twenty-foot cantilevered roof shades ribbons of art-glass windows below creates privacy and seamlessly connects the interior and exterior. Inside, the typical warren of rooms is discarded for a light-filled open plan, centered around a main hearth. Wright responded not only to the openness of the American landscape, but also to the more informal quality of the modern American lifestyle. 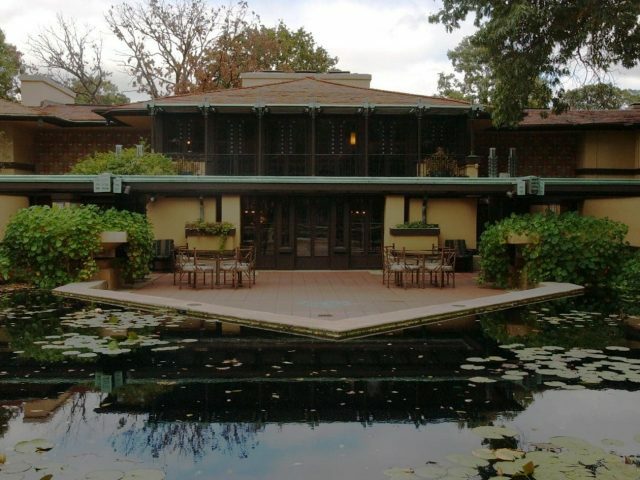 The Robie House’s influence on American architecture was immediate and undeniable. 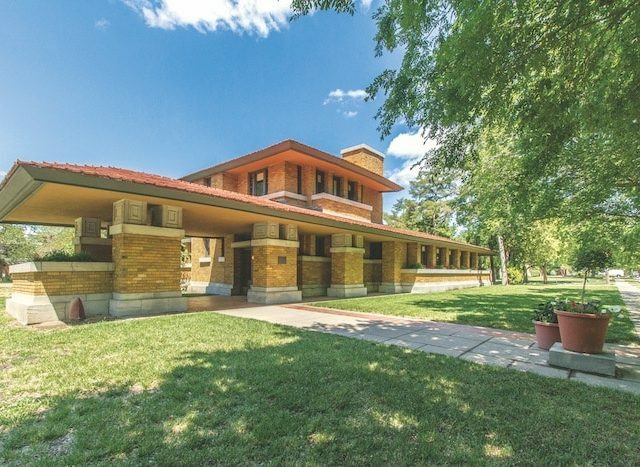 The meticulously coordinated design of the Robie House has made it the “measuring stick” against which all other Prairie School buildings are compared. In contrast to the home’s architectural staying power, Robie’s tenure in his home was short-lived. As a result of financial problems incurred by both the death of his father and the deterioration of his marriage, Robie was forced to sell the house after merely fourteen months. Robie’s financial troubles may explain why the plan to furnish the entire house with Wright-designed furniture was never completed. Threatened to be demolished in 1957, Wright returned to champion the Robie House as a “cornerstone in American Architecture.” The Robie House was preserved and continues to prove Wright’s keen regarding the direction of residential architecture in the U.S.